New methods of counting wildlife could provide conservationists with fast and accurate methods for estimating the abundance of natural populations. In a new paper published today in the journal Methods in Ecology and Evolution, mathematicians and conservationists from the UK, Africa and the United States discuss how they have used both machine-learning and citizen science techniques to accurately count wildebeest in the Serengeti National Park in Tanzania more rapidly than is possible using traditional methods. 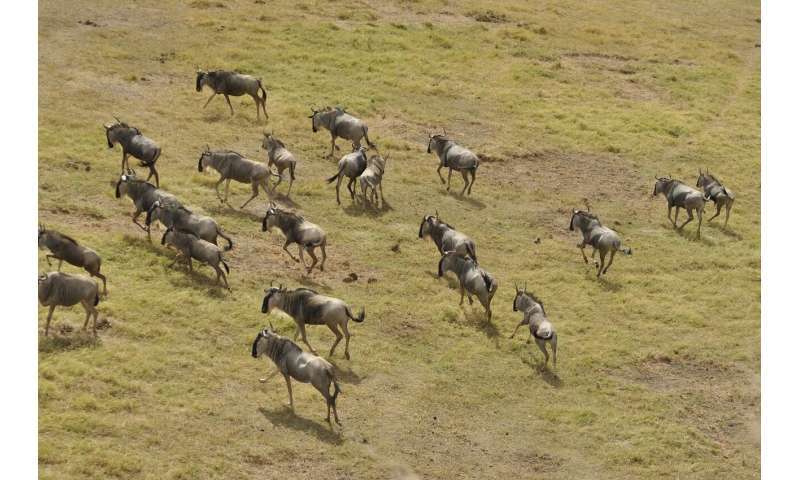 Evaluating wildebeest abundance is currently extremely costly and time-intensive, requiring manual counts of animals in thousands of aerial photographs of their habitats. From those counts, which can take months to complete, wildlife researchers use statistical estimates to determine the size of the population. Detecting changes in the population helps wildlife managers make more informed decisions about how best to keep herds healthy and sustainable. The team which produced the paper was comprised of researchers from the University of Glasgow, the University of Cape Town in South Africa, the Field Museum of Natural History in the USA and the Tanzania Wildlife Research Institute (TAWIRI). They used a deep-learning algorithm to identify the wildebeest in images taken from the 2015 aerial survey of the Serengeti National Park. The system was 'trained' to recognise wildebeest using 500 high-resolution aerial images from the Serengeti, then fine-tuned for further accuracy, eventually being capable of processing 1,000 images in less than two hours and able to produce a total count of over 20,000 wildebeest within 1 percent of a count conducted by a human expert. The team's second approach used the 'citizen science' website Zooniverse to publish a selection of the same images, with each large-resolution image split into 12 equal-sized tiles to make counting easier. Over three weeks in May 2017, more than 2,200 Zooniverse users looked at close to 10,000 of those images, offering their counts of the wildebeest in each image. To ensure an accurate count, every image was counted by 15 different volunteers. Dr. Colin Torney, senior lecturer in the University of Glasgow's School of Mathematics and Statistics, is one of the paper's lead authors. He said: "Wildlife managers need regular and accurate counts of animal populations to help them identify any changes and evaluate what's causing them. Without a good handle on population abundance, it's much harder for them to see the early warning signs of a decline caused by changing habitats or increased levels of poaching and start to take the proper steps to redress the imbalance. "Our approach gave us really good results, which I think shows the unique benefits of this type of cross-disciplinary collaboration. Our research suggests deep learning algorithms could support traditional hand-counting methods or, potentially, even replace them entirely as the primary means of processing the aerial photographs." Dr. Edward Kohi, a co-author of the paper and Principal Research Officer at the Tanzania Wildlife Research Institute, said: "These emerging technologies will enable TAWIRI to have an annual wildebeest survey as the time consuming manual work will be taken care of. The success of the machine learning approach represents a major milestone for wildlife survey techniques in Tanzania and across Africa. TAWIRI and our partners take this improvement very seriously and we are planning to apply this advancement to other wildlife species." Dr. Grant Hopcraft of the University's Institute of Biodiversity Animal Health & Comparative Medicine, is the senior author on the paper. He added: "The major driving force in the Serengeti's ecosystem is the abundance of wildebeest. Currently, there are about 1.3m wildebeest, which influence almost every variable in the ecosystem – everything from the return rate of fires, since they eat the grass, to the amount of insects that are available to migrating birds. Without wildebeest, the ecosystem would shift into a completely different state and therefore it's important to know how many there are. "About 8.5 percent of that population is lost each year through illegal bushmeat trade, predation and natural causes. The fastest the population can grow through calving is about 10 percent each year, so the margin for maintaining the population is pretty slim. "The work we've done with deep learning and citizen science is really encouraging, and we're keen to expand it further in the near future, perhaps for population surveys using satellite imagery. It's an exciting time for the field, and demonstrates the potential benefits that can be achieved from mathematicians and ecologists working more closely together." The team's paper, titled "A comparison of deep learning and citizen science techniques for counting wildlife in aerial survey images," is published in Methods in Ecology and Evolution. How does the loss of a wildebeest migration also harm giraffes?